Did you know you can freeze avocados? Just mash a ripe avocado or dozen, combine with some lemon or lime juice (as if making guacamole), add salt and pack the mash into silicone muffin cups. Freeze until solid then remove from the cups and place in a freezer bag. 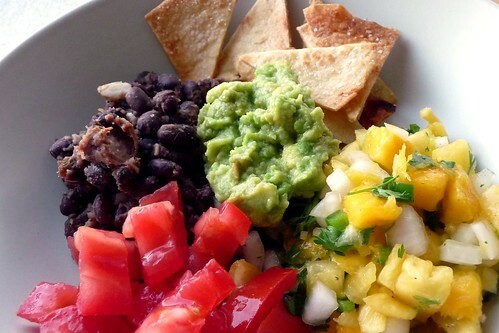 Works great for guacamole, random lunchtime tacos and adding to salads like this. Combine all, allow to rest for at least 30 minutes. Over moderate heat, heat lard in a nonstick skillet. When hot, add garlic and spices then cook for 2 minutes. Add beans and orange juice. Cook, stirring occasionally, until juice is evaporated and beans are thick. This entry was posted in dairy-free, gluten-free, mexican, one-dish, recipes, sauce, side, snack, untranslated, vegan, vegetarian. Bookmark the permalink.